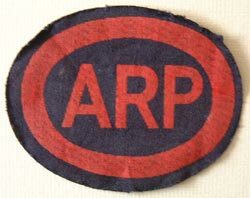 The ARP was brought into being in Britain in 1937 because of government concerns regarding a possible future war with Germany and the threat that might come from the air. 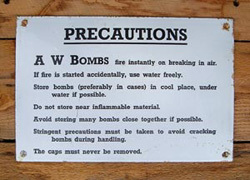 ARP wardens had numerous duties to perform but their main task was to warn the population of air-raids. In rural communities like Ramsbury this was often done by wardens riding bicycles through the village streets, blowing short blasts on a whistle. If poisonous gas was suspected then a wooden rattle was used. Fortunately Ramsbury was never deliberately bombed. However during the early years of the war enemy raiders would often fly over the village on their way to places such as Bath or Coventry and this kept the wardens at a high state of alert. When the blackout regulations came into force it became an offence to show a light after dark and the cry of 'put that light out' became the wardens' catch phrase. Below centre: Mr W.A. Smith in his anti-gas suit (light). Mr Smith was Chief Warden in Ramsbury during the war. (Mrs R. Connor). 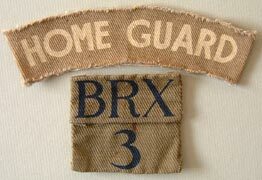 Below left: Early style Air Raid Precaution sew-on patch. Below right: In September 1941 the ARP and other organisations such as the Fire Service were reorganised into a single structure called Civil Defence. All wardens were issued with this new style badge. 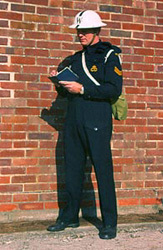 Below left: A reconstruction photograph of a Chief ARP Warden wearing a post September 1941 uniform. 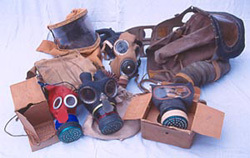 Below centre: Examples of most types of British WW2 respirators. 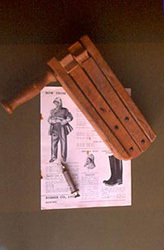 Below right: An ARP gas rattle, whistle and instruction leaflet. 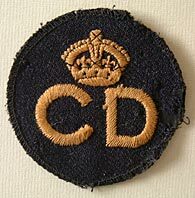 This volunteer army first came into existence in May 1940, although at this time it's official title was the Local Defence Volunteers (LDV). Initially no weapons or uniforms were available so the men had to train with pitch forks and shot guns. Their job was to form a back-up to the regular army should the Germans invade, and many units (especially in the south-east of England) were used to round up enemy pilots who had bailed out of their aircraft. 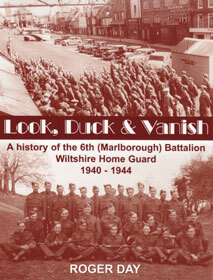 It was in August 1940 that the LDV became the Home Guard at Winston Churchill's suggestion. Ramsbury's platoon consisted of 65 men and their HQ was the Wesleyan Chapel in the High Street. After D-Day the likelihood of a German invasion was considered remote and the force was eventually disbanded in December 1944. 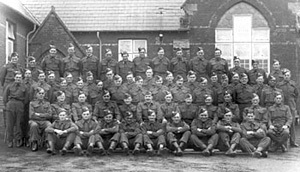 Below: Ramsbury Platoon photographed at the school in 1944. (Via J. Day). 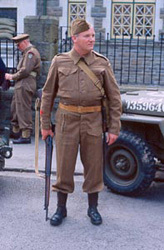 Below left: Reconstruction photograph showing a member of the Home Guard. Note leather belt, anklets and P17 rifle typical of the type of equipment issued to most Home Guard units. (Photo courtesy Seimon Pugh-Jones). 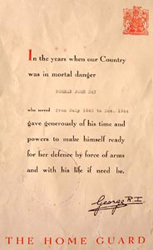 Below right: Following the disbanding of the Home Guard in December 1944 all members were issued with a certificate of service. Below left: Many Home Guard platoons were issued with a weapon called a Northover Projector. It was a crude but simple device which was easily manufactured, consisting of a hollow metal tube mounted on a tripod. 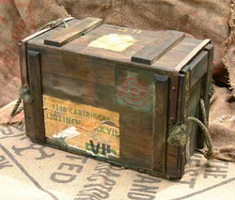 The 'Northover' was designed to fire the self igniting phosphorous grenade (SIP) and 24 of these grenades were packed into wooden crates like the example shown here. 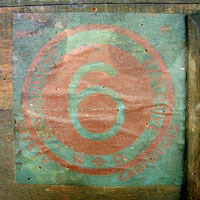 Below right: On the inside of the lid was screwed an enamel plate entitled 'Precautions'. This particular plate was found recently in the village of Aldbourne. 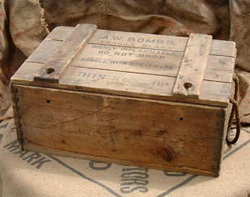 Below centre: An ammunition box, also from Aldbourne, which once contained 1,248 practice cartridges (.303 inch) in cartons. 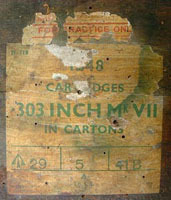 Remarkably it still retains a number of its original paper labels and two of these are reproduced below (left and right). 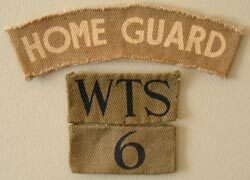 Below: Home Guard shoulder county and battalion titles worn on the upper arms of battledress blouses and greatcoats. The abbreviations WTS and BRX stand for Wiltshire and Berkshire respectively. The Air Training Corps (ATC) was formed in January 1941 as a way of identifying suitable candidates for the Royal Air Force before they became old enough for military service. Many cadets often travelled long distances just to get a flight in an aircraft. However Ramsbury's ATC members were lucky, having an aerodrome on their doorstep, and often flew with the RAF in Airspeed Oxford training aircraft, and later with Americans in C-47 Dakota's. Below: Ramsbury's ATC Flight Commander, Mr H.G. Ludlow. (P. Ludlow). 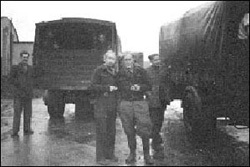 In 1941 a Prisoner of War camp was established at Lodge Farm, near Baydon. When it first opened it housed Italians who had been captured in North Africa. It was classified as a labour camp for prisoners who had volunteered as agricultural labourers, thus providing a useful supply of manpower to local farmers. The prisoners wore a uniform similar to the British battledress, but chocolate brown in colour with large circles of red cloth stitched onto the back of the jacket and the left trouser leg. Later in the war the Italians left and their place was taken by German POWs. 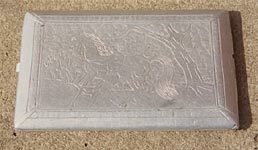 Below left: Cigarette holder manufactured from scrap metal by an Italian prisoner. Below centre: A group of Italian prisoners on Ramsbury airfield. The men are possibly on their way home after the war had finished. Many were not allowed to leave until as late as 1948. (H. Williams). 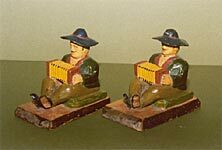 Below right: Two wooden bookends made by a German prisoner at Lodge Farm Camp in 1946.